The technology MDX (Material Discrimination X-ray) has given the food manufacturing industry incredible ease in contaminant detection. 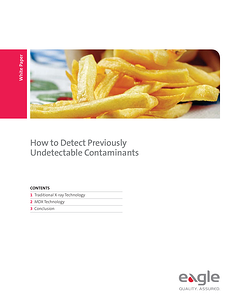 To keep up with the industry’s latest innovations, check out “How to Detect Previously Undetectable Contaminants.” This guide outlines everything you need to know about protecting your consumers as well as your brand, with the use of x-ray technology. Check out this guide to ensure you’re keeping your consumers safe by using the latest technology in contaminant detection.